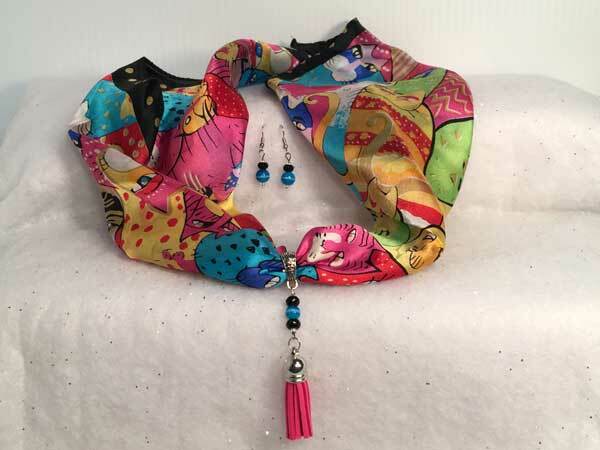 This beautifully soft 100% silk scarf is 20x20 and, as you can see from the picture, has just about every color in your wardrobe within it! The coordinating jeweled piece falls to almost 3" from the bail and begins with a pretty turquoise glass round surrounded by two fully-faceted black rondelles. Hanging separately from that is a lovely, dark pink suede tassel. The accompanying earrings fall to just under 1" from the loop and are made up of a black faceted rondelle atop a deep turquoise round, all surrounded by silver seeds.